← Spring to do list. Our shower head started leaking. In the process of fixing the leak, the shower head broke. Oh well. You can’t win them all. 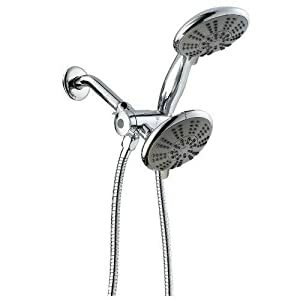 A shower head search has ensued. Here are the top contenders. #1 $58.99 This one is very similar to what we had…which broke. I can’t tell if it is made with plastic, which I am trying to avoid. #2 $29.99. I can’t tell whether it is metal or plastic but it does have a 1-year warranty. #3 $187.00. This one is substantially more, but very solid looking. 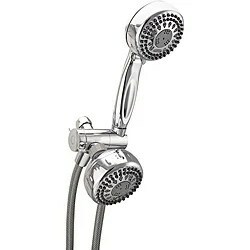 It does not contain plastic, and the hose is heavy duty stainless steel. I am sure there are other contenders I need to find. 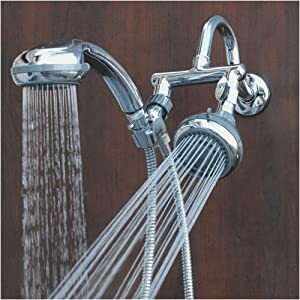 I am looking for the style reflected in each of these–to get the handheld and more traditional shower head from one spout. Is the expensive one worth it? Suggestions? 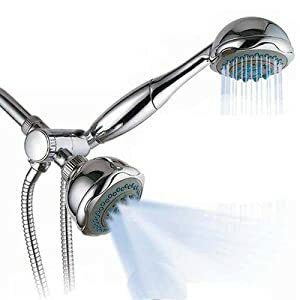 These kind of double shower heads looks powerful. Aren’t they consumer lots of water? 1 is enough for me on daily use.